You've never read Green Lantern: Rebirth? Well, there's never been a better time to change that as our writer reads the iconic Geoff Johns and Ethan Van Sciver comic for the very first time... and invites you along for the ride! Recently, Geoff Johns wrote a piece about his upcoming comic DC UNIVERSE: REBIRTH where he discussed the deep meaning the word “Rebirth” holds for him after writing GREEN LANTERN: REBIRTH and THE FLASH: REBIRTH. Considering the importance and popularity of both of those books among DC readers, it’s easy to understand why that would be the case. Or rather, it’s easy for fans who have read them. But I have a confession to make—I never have. I’ve read INFINITE CRISIS, FLASHPOINT and BATMAN: EARTH ONE. I’ve read all of Johns’ New 52 runs on Green Lantern, Aquaman and Justice League. But I never quite got to his two Rebirth titles. So with his latest in this thematically—if not directly—related series of comics on the horizon, I thought it was the perfect time to change that, and to take some of you on the ride with me. I’ve decided to read through both Green Lantern: Rebirth and The Flash: Rebirth, and write down my thoughts on each chapter here in the DCComics.com blog. These really are my informal, off-the-cuff notes, written right after I finished reading each chapter, highlighting what I responded to and why. They’ll probably make the most sense if you’re reading the graphic novel along with me, and that’s what I encourage you to do, especially if like me, you’ve never read it before. Even better, it’s a great time since both series are now available digitally for a greatly discounted price as part of the Road to Rebirth Digital Sale. Hopefully you’ll be able to relate to at least a little of what I’ve written down here. Feel free to share your own thoughts and opinions, whether they agree with mine or differ, in the comments below. Since we’ll be discussing the book as a whole, be warned there are some slight spoilers below. Okay, let’s get started! Man, it’s weird stepping back in time and remembering how different the world of Green Lantern was back when this was written. No Green Lantern Corps (to say nothing about the other corps that came later), Kyle Rayner is the only Lantern patrolling space and Hal Jordan is wrestling with himself as the human host of the Spectre. 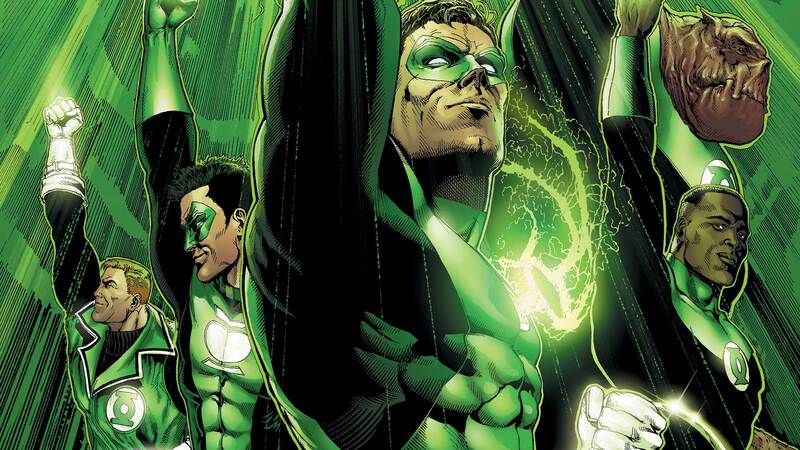 Green Lantern: Rebirth debuted in 2004, so there’s obviously been some time since it landed in stores, but the comic reads like one released today. It’s written and drawn by two men who are still very active at DC and who have quite a legacy with Green Lantern, and it’s easy to forget that you’re reading a comic that came out over ten years ago. As such, I’m finding the opening chapter a little jarring at times, particularly seeing a pre-BLACKEST NIGHT Black Hand. To be honest, I’d completely forgotten his main weapon used to be a device that would siphon off power from Green Lantern rings. Speaking of Black Hand, it’s downright disturbing what happens to him. You have to imagine that not knowing everything that comes after Green Lantern: Rebirth, plenty of readers probably found themselves siding with Batman here as he argued that Hal Jordan was a threat and enemy of the Justice League. But this is just the beginning. We have a lot more to read, so onward to Chapter 2! Now that I’m done reading this chapter, it’s clear that “Enemies Within” title has a much deeper meaning than it seemed at the start, as John Stewart, Guy Gardner and the other remaining Lanterns are becoming possessed by their rings. Also impactful was the flashback sequence where we learn the story behind Hal’s signature bomber jacket. It’s a backstory that makes so much sense in its simplicity that it’s a wonder it hasn’t been a part of Jordan’s story from the beginning. Now let’s see what the heck is going on with these Green Lantern rings. Ah, Chapter 3… The chapter where we finally learn what the heck’s going on here! This chapter may be a lot of exposition delivered to us by way of Kyle Rayner explaining things to Green Arrow, but it’s probably my favorite so far. It’s just so much fun to see Johns and Van Sciver laying the groundwork to what’s now become canon in the DC Universe. We learn the truth about Parallax here—that it’s actually a cosmic entity made from the yellow energy of fear that was defeated millennia ago by the Guardians and imprisoned in the Central Power Battery before it managed to escape and gradually possess Hal Jordan through his ring. I just love all of the little explanations we get here for things that had long existed in Green Lantern, such as Parallax’s imprisonment being the reason the rings used to have a weakness against yellow and the Spectre choosing Hal Jordan as his host because he hoped it would allow him to eventually destroy Parallax. Not all writers thrive within tight continuity, but Johns always has and it’s becoming clear that this series is him operating at his very best. Aw, yeah! This is the chapter we’ve been waiting for. Hal’s back and in a way that’s both emotionally fulfilling and totally badass. Another thought that I’ve been pondering since the previous chapter. Parallax as an otherworldly entity is some pretty amazing mythmaking. The idea of a giant creature made entirely of fear, who creates fear and paranoia in any world or nation it passes, which then drives them to war and violence, which then breeds more fear that the entity can feed off of sounds like the sort of thing that could have been conceived by an ancient culture trying to explain fear and mankind’s tendency toward violence. Of course, myths also teach us that humans are capable of defeating such creatures if they’re strong or brave enough, so let’s see if that proves to be the case here. The main Parallax storyline takes a breather this chapter so Hal can go mano a mano (you DO wear rings on your hands, after all) against his old rival Sinestro. And honestly, I can’t think of a better way to welcome Hal Jordan back to the DCU. I found myself really taking notice of the art in this chapter, oftentimes pausing to appreciate it. This is a big story told on as wide of a canvas as you can get. It features dozens of super heroes battling a giant, glowing space creature, and many of the panels have been pretty dense. Van Sciver’s nailed every one of them, but personally, I find myself really appreciating his pages and panels where I feel the characters and images have a little more room to breathe, such as these two spreads. There’s something about two men fighting in the vacuum of space, surrounded by emptiness that just grabs you. While destruction on paper serves as a visual indicator of strength, emptiness conveys a sense of vulnerability, which is an intriguing contrast considering the power these heroes wield. Okay, I DID NOT expect that second page! Hal is a far braver man than I.
It’s funny that with how complex and cosmic this story gets at times, the climax is refreshingly straightforward. Johns and Van Sciver scale back the size of the confrontation, leaving just the surviving members of the Green Lantern Corps to take on Parallax while the rest of our heroes watch from a distance. I also really appreciated that despite Hal being at the center of the story, he doesn’t—and seemingly couldn’t—defeat Parallax on his own. It takes the combined efforts of all the Lanterns to bring him down. While the Lanterns often work independently and many Green Lantern writers choose to focus on solo stories, I still think the Green Lanterns are more exciting when seen as part of a much larger corps and this ending seems to wink at that. I found it fascinating to see how much Batman seems to dislike Hal Jordan here, something that makes a lot of sense, but doesn’t really seem to be the case in current continuity. At any rate, it made for some surprising moments and funny lines. Looking at the series overall, it’s almost overwhelming to think of how far we’ve come. So much of what I now associate with Green Lantern, like the other Lantern Corps, doesn’t exist at this time. And yet, you can already see the sort of unrestrained imagination and vision on display that would later come to define Johns’ lengthy run on Green Lantern. Parallax is a fascinating concept, and if you know the Green Lantern universe, you know it only expands from here. But even without that knowledge, it’s impossible not to appreciate what Johns and Van Sciver have done here. They’ve taken a character with a lengthy, beloved legacy and one of the most well known and widely read deaths in DC history and have brought him back in a way that manages to feel both astonishingly “out there” and completely believable. It’s also highly relatable. After all, I’ve certainly had moments in my life where I was so consumed by fear that I couldn’t recognize my own actions. I think we all have. Will some of these same themes be present in Johns’ upcoming DC Universe: Rebirth? We’ll have to see. However, after seeing how confidently he managed to restore the light of one hero, I can’t wait to see how he does it for a whole universe of them. Again, please share your thoughts on Green Lantern: Rebirth in the comments below and don’t miss my readthrough of The Flash: Rebirth next Monday, May 23. See you then! The #DCTV Secrets of ARROW: Ep 4.22 "Lost in the Flood"